This pamphlet was written by a worker recently dismissed from the Post Office as a result of an injury on the job. He had worked in the Post Office for some time and remained in close contact with the strikers throughout the dispute. After months of negotiating, the Union of Post Office Workers and the Post Office Board had reached deadlock. The union claimed 15%. The Board would only offer 8%. The government had repeatedly proclaimed that it would oppose all ‘unreasonable claims’, especially in the ‘public’ sector. They had advised employers in the ‘private’ sector to do likewise. The workers in the Electricity Industry had just been subjected to a vicious campaign which had forced them to call off their work-to-rule. They had had to accept a Court of Enquiry. In the light of all the facts the U.P.W. claim was reasonable. But it was still too much for the P.O. Board, backed by the government. When the talks broke down, Tom Jackson announced he would call for strike action at the earliest possible date. Strange as it may seem, he said this even before he had reported back to his full E.C. The E.C. decided to instruct members to withdraw their labour as from January 20th. At the same time, postal workers gathered through the press, TV and radio that there would be no strike pay. The rank and file had not been consulted over timing or tactics. They were not even asked to vote on the proposal to strike. Or on anything else until the very end. They just awaited instructions. Although there were considerable differences of opinion on the best methods to be used in the struggle against the P.O. and the government, the workers responded almost unanimously to the union’s call. Only a small number, mainly telephone operators, failed to strike. The solidarity was magnificent. And this despite the fact that the postal workers belong to a union well known for its long record of cooperation with the employers at the expense of the men. Postal workers are however entitled to ask why their union had no funds after so many years without a major strike. why did the E.C. not make some effort to get money before calling the strike? Why was no effort made to get real cooperation from members of other unions, especially the Post Office Engineers? This should have been a major objective if the strike was to be effective. This was an ‘official’ strike. If the T.U.C. had wanted, it could from the very start have considered levying the whole of its affiliated membership. A two bob a week levy would have produced 18 million shillings (or £900,000) a week. That would have been something the strikers would have appreciated. It would also have been a blow to the government’s hopes of starving the Post Office workers into submission. The T.U.C. said they were behind the U.P.W. But it appears that they were a long way ‘behind’. From the beginning all sorts of ‘bright sparks’ were trying to cash in by offering alternative postal services, at very high rates. Large firms, banks, etc, made their own plans for handling and moving mail. P.O. engineers continued to service the telephones, including those exchanges where scabs were working. Workers in transport, docks, airports, railways, roads, etc, began to handle goods normally handled by postal workers. No appeals had been made to them for anything more than sympathy or a few bob conscience money. Tom Jackson and other trade union leaders were saying that this was not a political strike, or a strike against the government, but a simple industrial dispute. After talks between Mr Carr and a union delegation, Mr Jackson said he though Mr Carr was being ‘very fair and only trying to understand both sides’. How naive can one be? Surely Mr Jackson knew that the government was four square behind the Post Office. It took seven hard weeks to get Mr Jackson to admit that perhaps the government were, after all, ‘not neutral’. The postal workers’ solidarity won the admiration of other workers and gave the Post Office and the Government something to think about. Money and moral support began to arrive to relieve hardship among the strikers. Some unions were making donations, and offering interest-free loans. Collections on the job were being taken. The public generally were not unsympathetic to the postal workers’ cause. They felt that their claim was a modest one in view of the low basic wage-rates in the industry. The U.P.W. organised weekly rallies in London’s Hyde Park. The marches through the West End were impressive. Over 25,000 took part in the first one. The figure was nearer 50,000 by the fifth week, when the Post Office Engineers joined the postal workers in a one day token stoppage. 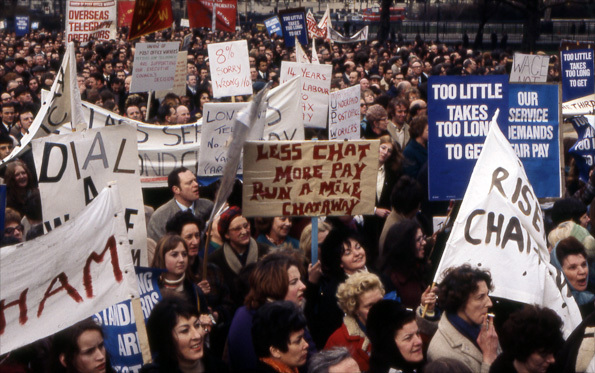 With such enthusiastic support we might ask why the leadership of the union did not consider marching on some of the Telephone Exchanges where scabs were still working. This would have been more effective than listening to speeches in Hyde Park. There were other places too where mail and parcels were being handled which should have had the attention of the strikers. The strike continued without must increase in the number of scabs. Attempts were made by the mass media to discourage the strikers by reporting various examples of scabbing and various ways which firms were using to undermine the strike. Everyone talked. There were talks between the union and Mr Carr. talks between Mr Carr and the P.O. Board. Questions in Parliament. But no solution. It was becoming clear that the tactics of the Post Office and Government were to starve the strikers into submission. But the strikers themselves showed no sign of weakening. At the end of the sixth week they strike was in reasonably good health. There was hardship, but they were ready to continue the fight for their full 15% claim. At this stage we decided to say a few words and produced the following leaflet, which was well received. There is too much double-talk about the Post Office strike. Workers everywhere admire the stand taken by the postmen and their great demonstrations of solidarity. The Government, employers and other thought the Post Office workers would be easy meat. They are finding them very hard to chew. Moral and financial support is fine and should be increased. But sympathy and admiration are not enough! More practical support is called for on all sides. What kind of support? The Post Office Engineers should not be helping to keep the telephone service going. They are stabbing their fellow-workers in the back. Moreover they are cutting their own throats in the process. Railwaymen, dockers, road transport workers, airport workers and other are all in some way or other handling mail and parcels. In doing this they are weakening the postmen’s fight. This Scabbing should stop! This is the kind of support that they are entitled to expect from fellow-workers. If other unions won’t act in solidarity, workers in these unions must act for themselves. If you are a Post Office striker, give this leaflet to a Post Office engineer, transport worker, docker or railwayman working in a parcels office. You may be told this is the work of ‘trouble-makers’. There will be a load more trouble for ALL workers if this postmen’s strike is defeated! At the beginning of the seventh week, the whole Executive Council call on Mr Carr with a proposal which they claimed might be a basis for ending the strike. What proposal? We don’t know. The E.C. did not consult rank and file postal workers about their ‘proposal’. Mr Jackson reported that his reason for approaching Mr Carr was that the strike could not continue because of shortage funds. The union had borrowed about £750,000. After talking at the Ministry for some fourteen hours the E.C. of the U.P.W. decided to recommend that the strike be called off without any offer from the Post Office Board. They promised to accept, in advance the decisions of a three-man ‘Committee of Enquiry’. The membership would be asked to ballot by branches, for or against the E.C.’s recommendation. This was hot news when the rally met in Hyde Park for the last time on Thursday, March 4. Mr Jackson and his E.C. met an angry crowd of strikers. They knew that there was a great deal of suffering among them. At this stage there were 30-40,000 hardship cases and insufficient help was coming in. Mr Jackson also knew that the postal workers would have continued the struggle, despite the sacrifices demanded, if the strike hadn’t been called off by the Executive. The E.C.’s proposals were accepted, but not without hard feelings and protests. The Merseyside men carried on for one day more, in protest, as they put it, at the ‘indecent haste’ with which the Executive Council had called off the strike. Why was the E.C. so concerned about the ‘democratic rights’ of the members at the end of the strike, but not at the beginning? Or while it lasted? They needed to say that the decision to give up was the will of the membership. After making all the decisions without consultation, after imposing 6 hard weeks of suffering in a fight which the postal workers had to endure almost alone, the strikers were to be ‘allowed’ to vote to return to work. The Executive’ s concern for the democratic rights of it’s members is a sham. They knew when to deprive the men of these rights and they know when to use these rights to whitewash their own base actions. The postal workers were manipulated into this position against their wishes. Part of the trouble was that they had illusions about the need for leaders who could do things for them. Many people, including so-called ‘militants’ are always appealing to workers to follow their leaders – or to elect ‘better’ leaders. Some of these militants held positions in unions and worked in places which handled black mail during the dispute. Why was there no sympathy action in support of the postal workers by ‘militants’, particularly among the Post Office Engineers? What is the good of holding positions on union executives if you can’t help in a concrete way then workers are in battle? Once again the workers felt let down. The time has come to consider why the workers feel they have been ‘sold out’ and what they can do in the future to avoid this fate. Workers feel ‘let down’ or ‘sold out’ because not enough of them have yet come to realise that the interests of the union officials are different from the interests of the rank-and-file workers they claim to represent. The interests of the officials are better conditions for themselves, infrequent elections, a quiet life, less expenditure on things like strike benefit, and more income from increased membership and subscriptions. We in Solidarity try to avoid using terms like ‘betrayal’ or ‘sell out’ when describing the repeatedly reactionary behaviour of the union hierarchies, for we deny that they are ever on the side of the workers, since they are little more than middlemen on the labour market, and depend for their continued power, perks and privileges on proving themselves useful to the employers. In this respect the leadership of the U.P.W. is not much worse – or better – than the leadership of any other union. It is certainly not alone in acting as it did. All Party and Trade Union leaders do this. Workers will have to learn how to exercise real democracy themselves. This means taking matters into their own hands and not relying on leaders who ‘con’ them into believing that they can act on their behalf. If postmen think Mr Jackson did not know what he was doing, let them read what he was reported to have said by the ‘Observer‘ the day the ballot was being held. Jackson ‘never wanted an all-out strike and advised against it from the beginning, but he had to recognise the enormously strong feeling among his members, that if there was to be industrial action only a full scale battle would satisfy them’. How did Mr Jackson know this? He never consulted the rank and file. ‘Mr Jackson would have preferred the tactic of lightning strikes in selected parts of the Post Office, bringing out sorters one day, the collectors another, the delivery men another. This would have caused complete chaos – as the Post Office itself admits – the trick being that people would still continue to use the services because the staff would still be working – after a fashion. This will be his tactic next time’. This quote is very revealing! According to the same report, Mr Jackson also claimed that ‘he knew a Post Office strike couldn’t be won if it lasted more than three weeks’. Mr Jackson seems to have had a lot of wisdom which he kept to himself. As we have said there was no consultation at all with the full membership. In fact I know from personal experience that postmen at Mount Pleasant only got their information from the Press, radio and T.V. right up to one day before the strike. Many did not agree with going on strike but had other ideas for dealing with the refusal to meet their claim. If Mr Jackson felt that a strike could not win if it lasted more than three weeks, why did he not say it at the time? If he knew that other tactics would be more effective, why did he not recommend these tactics? It is still not too late! Is he prepared to call on the workers now to operate a plan of the kind referred to in the ‘Observer‘ report? If Mr Jackson knew how effective such tactics could be – and if the Post Office knew it too – why did he recommend a less effective method of struggle, namely a full strike? Let Mr Jackson answer by correcting his ‘mistake’. I’m sure the postal workers would be very interested to hear, even now, how their full claim could be won. Remember that old conservative slogan – ‘a fair day’s work for a fair day’s pay’. Well, the postal workers are not getting a fair day’s pay. So they are under no obligation to do a fair day’s work. We distributed a second leaflet in Central London as the strikers were gathering to vote in the ballot. In this we took up some of the issues that had been left hanging in mid air. The solidarity of Post Office workers these last few weeks has been magnificent. The government, the Post Office and others thought these workers would be easy meat. The found them very hard to chew. The Union Executive Council has now unanimously recommended a return to work. They have agreed to accept the verdict of a three-man Committee of Enquiry. The workers are being forced back because of hardships. They were isolated and did not receive the support they were entitled to expect from Post Office engineers, dockers, railwaymen, airport and other transport workers. All these handled mail on a large scale. The fight can continue at work. Find your own ways and means. Clearing the backlog is management’s problem. Don’t trust trade union or party leaders. Workers should know by now what happens if things are left to ‘official leaders’. DON’T RELY ON ANYONE BUT YOURSELVES AND OTHER RANK-AND-FILE WORKERS. The postal strike will live in the minds of all who took part. It was a great display of solidarity and courage. It will also live in working class history as one of the longest national strikes without strike pay. We hope it will give rise to some serious re-thinking among militants. This strike could become a starting point for alternative methods of struggle, now open to many workers in industry. It highlights the need for rank-and-file organisation on the shop floor as the alternative to following ‘leaders’ of unions or political parties. The idea that workers can rely on their own power, used and managed by themselves, can be the most important development in future struggles with the employers and their trade union and other stooges. The three-man Committee of Enquiry, the Government and the Post Office should beware. If the postal workers do not get a fair deal, they will be obliged to take this matter into their own hands. This goes for all other people (industrial workers, students, teachers, white-collar workers of all kinds) who are struggling for freedom from those who order, manipulate and exploit them. Many of the postal workers are now very bitter and some short-sighted things are being said or thought. Some post office workers may say they will not help the Post Office Engineers when they are due to fight for their own wage claim. I hope I am wrong. Some postal workers man even say that strikes are of no use, or too costly. This would also be wrong. What workers need to consider are new methods of struggle, which hit the employers without causing too much suffering to the men. Certainly the employers and the government hope to make strikes more difficult to sustain and to discredit them altogether. This was the objective of the government in its stand against the Post Office workers. In fact the government’s sights are set even higher. They hope, by means of the Industrial Relations Bill, to make militant action a crime when organised by rank-and-file workers. Unofficial action of all kinds will be subject to legal sanctions which do not apply at the moment. It would be illegal for anyone to call for support for those on strike. Equally misguided would be the conclusion, now being advocated by some who consider themselves radicals or revolutionaries that what is now needed is to ‘bring pressure’ on the T.U.C., or on the leaders of various unions to unite with a view to leading more effective fights. As we have shown this is not in keeping with the interests of these leaders, who are there to help the system work more smoothly. To count on them to fight is to foster illusions. The idea that the leaders will expose themselves in the course of these ‘struggles’ and that this will result in greater awareness on the part of those who are being ‘sold out’ is a myth. What usually happens is demoralisation and a reluctance to take-part in further struggles. Workers must not be manipulated in this way. They must learn the simple truth that they can only rely on themselves. It was a costly strike for the Post Office Board and for many businesses. Things in the Post Office can never be the same. The ‘goodwill’ of the men will be lost for a long time. But it goes even deeper. The government and employers are beginning to doubt the reliability of the trade union leaders to do their job of holding workers back. Those in power know the score. Their offensive is against all those who are discovering how to fight authority in all its forms, against all who take matter into their own hands, whether it be for wage increases, control of the job, better housing or opposition to being pushed around by all sorts of bureaucrats. We are all having to deal with orders, at work and in our daily lived, on an ever-increasing scale. We can only resist this if we begin to organise on the job and where we live. This applies to all sorts of community matters, where people can get together to defend themselves against the encroachments of local and government authorities. We are kidded into believing we live in a democratic county. Nothing could be further from the truth. We should start exercising out real democratic rights. We should place less faith in voting, once in a while, when our masters allow us to. And we should exercise more control, and more continuously, over out real life situations. Industrial workers and others are now in a good position to decide on new methods of struggle. Strikes, in which we leave the factories and offices in the hands of the employers while we walk the streets, may not always be the best way for us to fight. Why not use a little imagination? Why not stay in and run these factories and offices for ourselves? It has been done before. It could be done again. The Post Office strike will not be forgotten. It will not have been in vain if it makes us look again at all the weapons we ordinary people have in our own hands, if only we decide to act for ourselves. People are always being asked to follow some political leader or other, who will get them what they want. The leaders always finish up helping themselves at the People’s expense. ‘God helps those that help themselves’ is an old saying. We would add that you don’t need any Gods to help you if you can help yourselves. And you can! Get together, discuss problems with your workmates. Don’t leave it to others to decide for you. As I finish writing this, a report is coming over the radio which says that telegraphists at Electra House in Central London are staging a sit-down strike against conditions being imposed since their return to work after the strike. Yet again, the workers will show that they are going to have the last word.